The Patagonia Rio Azul Fly-Fishing Waders for Men are Patagonia king sized fly-fishing waders for men that are extremely lightweight and very packable that are constructed using an H2No Performance Standard polyester plain-weave shell that features a waterproof and breathable barrier and also contains a C6 DWR finish with fully taped seams. These king fly-fishing waders for men are great for traveling fly-fisherman and backpackers because these king fly-fishing waders for men are very lightweight and extremely packable and really great for traveling to and from your most favorite fly-fishing destinations. The Patagonia Rio Azul Fly-Fishing Waders for Men are designed with single seam construction that completely eliminates seams from the highest wear points on the inside of the legs. These king fly-fishing waders for men also features a full elastic belt with male and female buckles on adjustable suspenders to be more cleanly worn as pants that is just one more awesome element of these very innovative and lightweight king fly-fishing waders. The Patagonia Rio Azul Fly-Fishing Waders for Men are also constructed with a laser-cut Hypalon utility keeper to provide easy access to fly-fishing tools and also offers daisy chains for tools and an internal center-back hanger loop for easy drying ability. These king fly-fishing waders for men are also constructed with articulated legs and anatomically fit left and right booties that fit like a sock that are made with 4mm neoprene that resists compaction and are also extremely durable. These king fly-fishing waders for men also features flat-panel construction and gravel guards for less abrasion and improved durability, so make sure to check out these very innovative and lightweight and packable king fly-fishing waders for men by Patagonia. 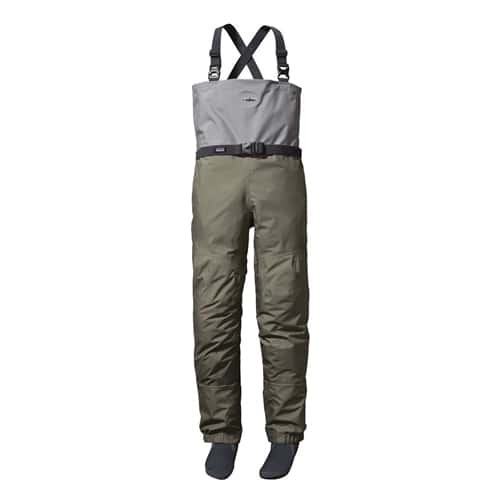 I am 5'9" tall with a size US9 foot and these waders fit well, with room for extra socks and jacket/sweater. I really like the way these waders pack up in my backpack in a nice tight bundle. Much more compact than my previous chest waders. These Patagonia Men's Rio Azul Waders are high quality men's fly-fishing waders that are built tough and very comfortable to wear. These Patagonia Men's Rio Azul Waders also really look great and are very fun to fish with.